The son of Odin and Jord; the Earth Goddes. 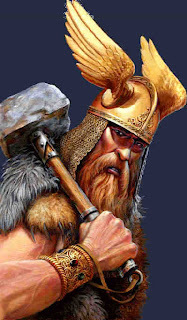 Thor was the strongest of the Aesir, the collective name for the principal race of Norse Gods; they who lived in Asgard, and with the All-Father Odin, ruled the lives of mortal men, Known as the God of Thunder, his hall is Bilskirnir, which Is located in the region Thrudheim (A Place Of Might). Thor married the golden-haired Sif, a Goddess of Fertility. He kept a mistress named Jarnsaxa (The Iron Cutless), with whom he had two sons, Magni and Mosi and his daughter is Thrud. Thor was usually portrayed as a large, powerful man with a red beard, flowing hair, hearty enjoyment of food and drink and eyes of lightening. Despite his ferocious appearance, he was very popular as the protector of both Gods and Humans against the forces of evil. 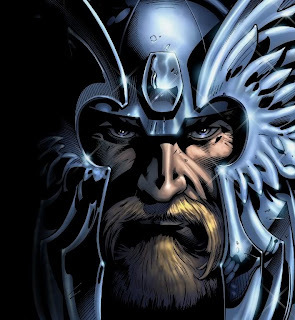 He even surpassed his father Odin in popularity because, contrary to Odin, he did not require human sacrifices. In his temple as Uppsala he was shown standing with Odin at his right side. 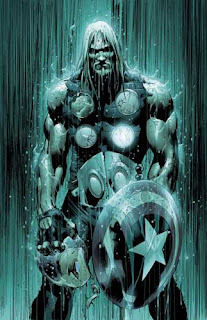 They say Thor presides over the air; he governs the Thunder and Lightning, the Winds and Rains, Fair Weather and Crops. If a plague and famine threaten, a libation is poured to the Idol Thor. The Norse believed that during a Thunderstorm, Thor rode through the heavens on his shariot pulled by the goats Tanngrisni (Gap-Tooth) and Tanngnost (Tooth Grinder). Lightning flashed whenever he threw his hammer Mjollnir. Mjollnire (That Smashes) was made for him by the dwarfs Brok and Eitri, who made many magical objects for the Gods. Thor wears the belt Meginghard which doubles his already considerable strength. His greatest enemy is Jormungand, the Midgard Serpent. At the day of Ragnarok, Thor will kill this serpent but will die for its poison. His sons will inherit his hammer after his death. Ragnarok (Doom of the Gods), also called Gotterdammerung, means the end of the cosmos in Norse mythology. Thor was very well-known for his quick and hot temper. This was often vented on the Giants, the main enemies of the Gods. Thor would smash their heads with his mighty hammer Mjollnir. To wield this awesome weapon he needed iron gloves and a belt of strength. 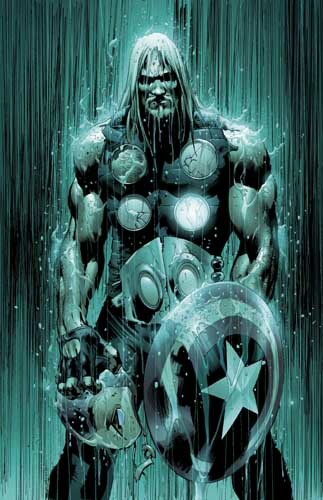 Mjollnir would return to Thor’s hand after being thrown and was symbolic of lightning. Thor was foremost of the Gods to the common man, who would call on him to ensure Fertility, and widely worshiped. Hammer shaped amulets, a symbol of Thor because it was his weapon, were worn about the neck well into the Christianization of Scandinavia. There are molds from that time which contain both cross and hammer shapes, side by side. His name occurs in numerous place names, and it was his statue which was central in the great temple at Uppsala. He was associated by the Romans with Jupiter. Donar was an early version of Thor among the early Germans. The Anglo-Saxons worshiped a Thunder God named Thunor. Thor has lived on, not as a part of any religion, but on our weekly calendar. Thursday (Thor’s Day) was derived from this mighty God.